Red Sox prospects not in my Top 50, but should be! 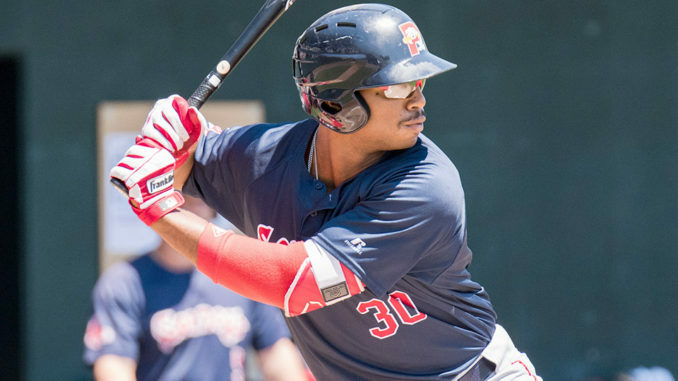 I wrote up my midseason Boston Red Sox Top 50 Prospects back on August 2nd. I spotlighted who I believed at the time were the 50 best prospects in the Sox farm system, plus another 11 players who’d I considered honorable mention having just missed the cut, AND one other “bonus” name for those deep dynasty leaguers searching for that diamond in the rough. In doing that article I was bound to miss some names and now that the 2017 Minor League Baseball season is over, here are 6 additional names who should have been on the list and very likely will be on my 2018 Red Sox Top 50 this coming January. 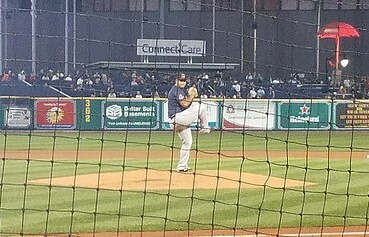 I saw Jimenez start for Portland on August 31 in Hartford, which was the Yard Goats’ last home game of the season. He looked good, not overpowering, but showed why he belongs on this list. He brought his Double-A ERA under 3.00 that night to finish with a 2.91 ERA for Portland. In 8 games with the Sea Dogs he was 5-0, which followed up 18 games in Salem (A-Advanced) where he was 10-3 with a 3.07 ERA. He’s not a big strikeout pitcher (only 118 in 146 IP) but the Venezuelan knows how to battle and win. I have to credit JW Gravley (@JWGravley) from ESPN Blacksburg with turning me onto Jimenez as he was able to watch him pitch in Salem earlier this season and kept touting him to me as one player in the system to keep an eye on. Luvullo, the son of former Red Sox coach and current Diamondbacks manager Torey, played in 3 MiLB levels for the Sox this year – A-Full Greenville, A-Advanced Salem and Double-A Portland. After mediocre numbers in Greenville he got going in Portland with a short 6 game stint (5-17, .294 AVG and .400 OBP) and then finished the year very strong in Greenville slashing .329/.441/.447 in 27 games. There are a lot of middle infielders above him on the Red Sox depth chart but I wouldn’t be surprised to see him crack MLB Pipeline’s Red Sox Top 30 in the next year or so. Also from Venezuela, Lozada was signed in July 2015. He was assigned to the GCL Red Sox (Rookie League) in late June and posted a .314 AVG in 44 games. There’s not much power in his swing yet but he knocked in 20 runs and had 6 SBs in 144 at bats. Lozada finished his season in 3 games for the Short Season Lowell Spinners and enjoyed a healthy 7-12 (.583) in that late season small sample. Look for Lozada to start in Lowell in 2018 or possibly be bumped up to Single-A Greenville. This kid’s actually been around for a several years but he’s still only 21. Gonzalez spent 2013 and 2014 in the Red Sox rookie league as a 16 and 17-year-old, then 2015 in Lowell. It’s been back and forth between A-Full Season Greenville and A-Advanced Salem over the last couple years. I expect him to be a fixture in Double-A Portland in 2018 with his eyes set on Triple-A, possibly even Boston a la Abe Alvarez back in 2004 as a 21-year-old who made the jump from AA. Gonzalez put up some very nice numbers between Greenville and Salem this year, with a combined 12-3 record, 2.73 ERA, 1.02 WHIP and 113 K in 116.2 IP. What’s even more impressive in my book are his Salem only stats (5-0, 1.31 ERA, 0.87 WHIP, 31 K in 34.1 IP and an opponent’s batting average of .195. Deep, deep sleeper alert here. Seriously? A 29-year-old prospect? I know my Prospects1500 colleague Phil Goyette (@PhilOfSports) doesn’t like 25 or 26-year-old prospects for that matter. In this case I have to throw age out the window and look purely at Barfield’s numbers and on-field performance, AND his perseverance. The younger son of former MLB All Star and AL HR champ Jesse Barfield (and brother of Josh) has been around since he broke in as a 19-year-old in 2008 with Vancouver at the time in the Midwest League. His 10-year MiLB career has spanned Low-A, to High-A, to the Venezuelan Winter League, to AA and AAA, to Mexico, and all points in between. Now in 2017 he tore up Double-A and was part of the Eastern League All Star Classic in Manchester, NH this past July. Call it what you want and say he’ll never have a shot at the majors as a 30-year-old, but I personally think he has more of a shot at big league OF success than does Bryce Brentz or Rusney Castillo. After Barfield elected free agency in November 2015, and didn’t even play pro ball in 2016, he signed with Portland in late May this season and took off from there. 28 HR, 76 RBI, .293/.368/.589 are his 2017 stats. Barfield was promoted to Pawtucket on September 2 and proceeded to go 4-5 with a HR and 2 RBI in his first AAA action since 2015 with the Albuquerque Isotopes. If there’s a criticism it’s his K-rate, striking out 90 times in 355 AB – a bit more than once every four at bats, not unlike a lot of other MLB power hitters. Are Judge and Gallo K’ing at all this year? I say give Jeremy a chance! Here’s a talented southpaw who definitely opened eyes in A-Advanced Salem and Double-A Portland, mostly at the backend of Salem’s (16 games) and the Sea Dogs’ bullpen (27 games) in 2017. Out of all MiLB relievers Poyner ranked 9th on Chip Bourne’s (@ccbournejr) “Mayberry,” which takes into consideration K/9, K/BB, ERA and HR/9. Qualifications for that Mayberry ranking were > 30 IP and < 6 GS. Poyner was strictly relief with no games started. His impressive combined numbers: 43 G, 60.1 IP, 15 SV, 84 K, 11.7 K/9, 4.94 K/BB, 1.49 ERA, 0.93 WHIP, 0.54 HR/9. Definitely look for him to pitch in Triple-A in 2018.